The island of the Statues! Kalymnos is one of the most interesting islands of Dodecanese.The island is also called "Nisi ton Agalmaton" (island of Statues), because it has many statues which were made by expenses of the sculpture Mihali Kokkinou and his daughter Irinis Kokkinou-Lalopoulou. This island of barren rock, golden beaches and tiny green valleys owes its fame to its celebrated spongefishers. This is the main profession for men on the island, and the theme for many local dances and folk songs. 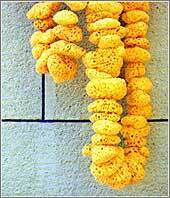 Sponge-fishing means a yearly excursion to the seas off the North African coast. Sponge-fishers of Kalymnos leave with their boats every spring. Their departure is a moving and important event which is therefore accompanied by glamorous religious ceremonies. After approximately five months' hard work sponge-fishers return to the island. The whole island puts on festive dress and prepares to celebrate the return of the sea- beaten sailors. In the southwestern part of the island you can visit the cave of Kefala or Trypa, with its stalactites and stalagmites, as well as the caves of the Seven Virgins or Cavern of the Nymphs at the foot of mount Flaska, the cave of Scalia to the SW, also Therma - radioactive springs (about 1 km south to the city) recommended for many illnesses. Around Chorio there remain ruins of the church of Jesus of Jerusalem, built towards the end of the 4th century AD. The most beautiful beaches are on the west coast of the island and are Panormos, Kantouni, Linaria and Plati Gialo.Other beaches on the west coast are Mirties, Masouri, the gulf of Arginonta and Emborios.On the east coast of the island there are beaches in Ormo Akri and at the harbor of Bathi. You can rent surfboards on the island for windsurfing. In Kalimno you will find buzukia, discos, bars and a cinema.Restaurants, taverns, discos and bars you'll find many in Masouri and Mirties. 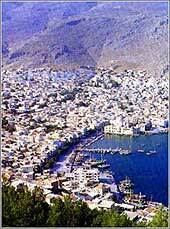 Limin Kalymnos - Offers good shelter form the meltemi. If there are strong southerly winds the harbor can become uncomfortable. There is both fuel and water on the quay. There is also good provisioning and a number of tavernas. Vathi – Is a fjord which is extremely attractive with its lemon and orange groves. There is a mole you can anchor on to. The fjord offers good shelter from meltemi There are tavernas, water and some supplies available. Ormiskos Vorio or Emobrios – A small bay with a T-pier which is usually occupied by the fishing boats, you can anchor off in the bay. There is a small taverna and offers fair shelter from the meltemi. Vlikathia – A small bay with beautiful summer villas. There is a taverna ashore and offers good shelter from the meltemi.